Apply to be a Winter Intern for Cindy Short Photography! 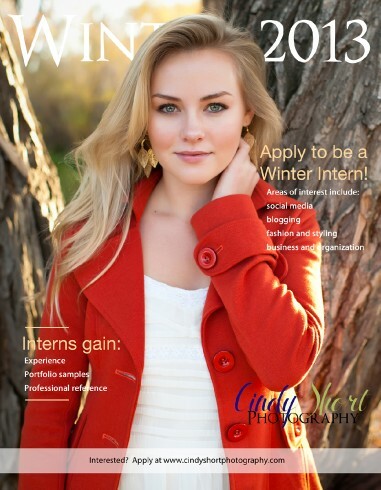 The Blog » Apply to be a Winter Intern for Cindy Short Photography! I am seeking interns for Winter 2013! The internship runs from January - May and includes working with high school and college seniors as well as writing for and posting social media, preparing a styling guide and working with local businesses. I would love to talk with you about this internship! Email me questions at cindy@cindyshortphotography.com or apply here. Bonnie Werner - Hi Cindy! I hope you remember me from our very short introduction at Timberline Church the evening for the practice run for The Bridge Christmas evening. I am so very sorry I did not get to attend as I came down with the horrible stomach flu, that lasted almost a week...it was debilitating to where I was in bed for days. I am well now, Praise the Lord! I would love to get together with you as we thought we may be able to. I would actually love to be able to work with you (even your intern ;) ..) if you would like. I would love to help you in any way you would need it. And, I believe I could learn a lot from you..as I always believe that God has so much more out there just waiting for His children to seek out. Your work is amazing, I love it. I personally haven't added any new pics as the website I have now is in the process of being reinvented with all new work. Tessa Gural - I would love to work for you as an intern, Cindy. I had so much fun during our photo session. I enjoy working with people, fashion, cosmetics, and photography. I have worked in the business office of our plumbing company for a few years and I am currently taking a college composition course and enjoy writing. You are a wonderful photographer and business woman and I would love the opportunity to learn from you. My photos are special thanks to you.